Myanmar launched the Tourist e-Visa system on 1 September 2014. e-Visas are issued online for tourism and business purposes only. By using iVisa, travelers of certain nationalities do not have to visit the consulate to apply for a Tourist e-Visa. You can submit all the required documents and information and pay the visa fees online. This streamlined system cuts out the time wasted waiting in lines and costly processes that were previously in place. The Myanmar Tourist e-Visa is an official document issued electronically by the Government of the Republic of the Union of Myanmar. Applicants will receive their visas via email, after filling the application form with the necessary information and once the online credit card payment is completed. As a national from Brunei, Cambodia, Indonesia, Laos, Philippines, Thailand and Viet Nam, you DO NOT require a visa for tourist visits of UP TO 14 days if entering and departing from Yangon, Mandalay, or Naypyidaw International Airports.If you would like to stay in Myanmar over 14 days, or wish to enter or exit from ANY of the land border checkpoints, then please apply for the appropriate eVisa. The passport-style color photo must have been taken in the last 3 months. Myanmar Tourist e-Visa holders are allowed to stay in Myanmar for a maximum of twenty-eight (28) consecutive days in one single entry. Travelers must have passports with at least 6 month validity from the planned date of entry. The Myanmar e-Visa is valid for ninety (90) days from the date of issue. For children over 7 years old, or for those who already have an individual passport, the parent must apply separately for their e-Visa. The details of the child must be included in the parent/guardian’s e-Visa. Passport with at least 6 months validity from the planned date of entry. Passport-style color photo taken within 3 months of your application. A debit/credit card or Paypal account for payment. How much does a Myanmar Tourist e-Visa cost? The Tourist e-Visa costs 50 USD. Additionally, there is a service fee of 20 USD for standard processing. For rush processing and super rush processing the service fee is 50 USD and 80 USD, respectively. The Myanmar tourist e-Visa is valid for 90 days after issue. This means you must enter Myanmar within 90 days. It is a single entry visa and allows for a maximum stay of 28 days. What requirements should my passport meet if I want to apply for a Myanmar Tourist e-Visa? Applicant’s passport should have at least 6-months validity from the time of entry into Myanmar and at least one blank page. I plan to travel to Myanmar in three months, can I apply now? Your e-Visa will only be valid for 90 days after it has been issued. If you already know your arrival date in Myanmar, you can start applying immediately with iVisa. We will initiate your application at the right time so your e-Visa is valid during your whole stay in Myanmar. How many entries do I get with the Myanmar e-Visa? It is only valid for a single entry. Which nationalities can apply for a Myanmar Tourist e-Visa through iVisa? What size is the entry stamp on the passport for e-Visa? My application was denied, what should I do now? You need to apply for your tourist visa at your nearest Myanmar consulate/embassy. I do not have my hotel bookings, can I apply online? Can I enter Myanmar with my e-Visa visa at any point of entry? My child is under 7 years old, does he/she need a separate e-Visa and what are the costs associated? Children under 7 must apply with an adult. There are no additional costs – they will be added to your Myanmar Tourist e-Visa at no extra cost, thus the total amount will still be $50USD per person (excluding the service fee). No. If you are visiting Myanmar via cruise/boat, please contact your travel agent for a pre-arrangement Visa on Arrival. 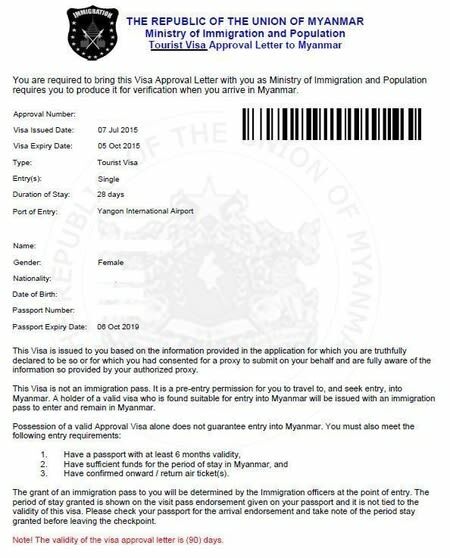 *You can NOT not use the Myanmar e-Visa to enter Myanmar via seaport. I plan to travel from Myanmar to another country for a short trip and return to Myanmar. Do I need to apply for two Visas within such a short period of time? Yes, you will need to apply for two e-Visas. Each e-Visa is only valid for a single entry. Myanmar has growing tourism, and if you were there a decade ago, what you find today is almost entirely different. That is because more and more people choose Myanmar as their destination, and capitalism is starting to get a grasp of the country. That is not necessarily a bad thing, but as you can imagine, it may ruin some of the things for many people, mainly locals. Even so, Myanmar is an interesting country to visit with plenty of attractions. You will like it there. The best thing you could do in Myanmar is backpacking. There is not much to do in just one place. You may be wondering when it is the best time to visit Myanmar. That depends on how much heat you can stand or how much money you are willing to spend. I say that because most people go there November through February. The weather is perfect during that period. However, the prices skyrocket. It is Myanmar’s busiest season, and as you can imagine hotels and attractions take advantage. There is nothing wrong with that. Every country does it. However, if you want to avoid all that over-crowding and the high prices, you can go to Myanmar in June. It is hot, to be honest, but at least the prices come down. June through November is the monsoon season, and nobody likes visiting Myanmar during that time. One thing that will throw you off when you get to Myanmar is the numerals. You will probably do not understand a thing. That is why you should always carry a business card from the hotel you are staying at. That way you can show the taxi driver where you are headed. The numbers on the buses are also confusing, but you can ask a local to help you out. A lot of people go to Myanmar for the temples and the pagodas. The country has deep religious backgrounds so you will see a lot of those. However, there are some things you need to know if you want to visit these religious sites. For one, you should never enter a temple or a pagoda with your shoes on. It is considered disrespectful, and you will not see anyone with their shoes on inside. Instead, you can pack a pair of flip-flops and put them on when you get there. You should have a plastic bag to put your shoes in while you are inside. Some temples have a designated place for people’s shoes, and you can leave them there without fearing you are going to be left without. Another thing you should know is that you should never eat, give, or receive an item with your left hand. The left hand is considered unclean. You will find this habit in many cultures, not only in Myanmar. Even if you are left-handed, you should make an effort and do most things with your right hand. It is a sign of respect. Also, when you are in a temple or a pagoda, you should never aim your feet at a Buddha. It is considered a bad form. But do not worry as you will have where to aim your feet at since Buddhas are not on all four walls of a room. Myanmar, while still a developing country, does have cell phones and Wi-Fi, but you will most likely lose your patience using the internet. It is very slow, even in hotels. You may have to wait up to one minute for a page to load, and that can cause you some frustration. If you need things like maps, for example, you should get an app that works offline. That way you will not get lost or have to wait forever for a map to load. Loading photos on social media is almost painful because it takes forever as well, so you may want to share your vacation pics when you get home. Another thing that you should keep in mind before going to Myanmar is to have cash on you. There are ATM, but they are scarce. Plus, the withdrawal fees are way too high. Moreover, most of the places you will find in Myanmar do not take credit or debit cards. If you are not from the US, you should exchange your money in US dollars. You will not find all currencies there, and you may end up not being able to buy anything even if you do have the money. Lastly, avoid exchanging your money on the black market. You may be tempted to do so because of the better rates, but you may end up with some counterfeit bills in your pocket, and nobody needs that hassle. There are some negative parts of Myanmar as well. For example, the people there do not sit well with hygiene or sanitary conditions. If you are a little squeamish, you may not want to go there at all. You may see rats running down the street, and people litter a lot. Nevertheless, this happens in the urban area more than in the countryside. If you want to go backpacking, you need to go through the cities, but you may want to close your eyes until you reach the location you want to see. The people in Myanmar are relatively friendly. They are just getting accustomed to tourism because it started booming in the recent years. However, you need to be respectful of their traditions and habits. Do not show your amusement when you see that men wear skirts, for example. You do not want to be that person. Also, you should never bring up politics into the discussion. Religion should be off limits too. If, however, a local brings up those topics, you should let them speak and lead the conversation. It is best if you stay out of it entirely. Overall, Myanmar is a country worth visiting if you want a new experience. Tourism is still developing, which is why you should not expect too much. The infrastructure is not complete, and capitalism is a new thing there. But even so, this country should not be overlooked when you are seeking new travel destinations.